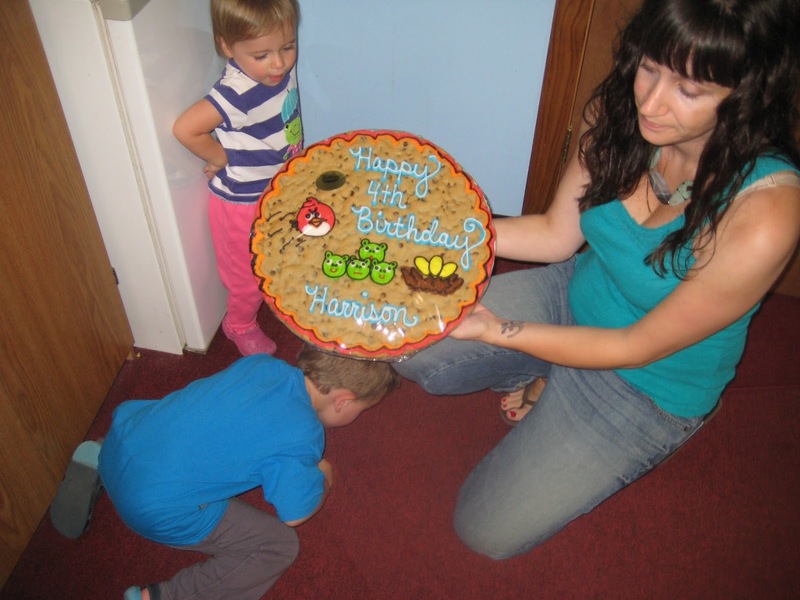 That’s right: Raegan is a mini-mama with hands on her hips, I am clearly less than thrilled with the situation, (the cookie looks delicious), and the birthday boy is face down on the floor, crying. That, my friends, was our reality smack dab in the middle of HD’s party this morning. HD crawled in my lap, held on to my arm, and let his party goers serenade him. I started the singing but barely got through one “Happy Birthday to you” before I started to get choked up. I whispered the next line, but then I just had to bury my face in my little man’s neck and hold him while the others finished the song. Again, I’m not entirely sure why this happened. It could have been the lack of candles. 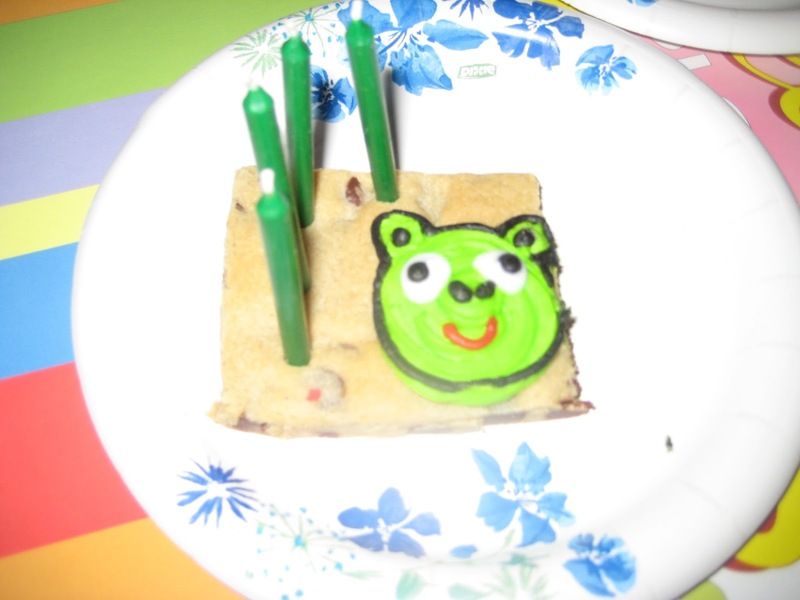 I knew I would start crying at some point the minute I realized my specially selected to match the Bad Piggies green candles were still on the counter at home and that there wasn’t enough time to run out for a replacement (Hello, we had a room of three, four, and five year olds; no one was going to wait much longer for their cookie!). Perhaps the postpartum hormones were the culprit. I mean, I know I’m an emotional girl, but typically this kind of thing would make me cuss, not cry. Or perhaps the enormity of how quickly my babies are growing just did me in and made me weepy. Either way, I stood up from the song and spent the next few minutes wiping my eyes on the sidelines while Ben dished out the goodies. To the extreme credit of our gathered family and friends, no one asked me what was wrong or if I was OK (those questions always make it so much worse for me when I’m upset). Maybe the whole just-had-a-baby thing gave me a free pass to be weepy? Again, I don’t know, but I’ll take it. 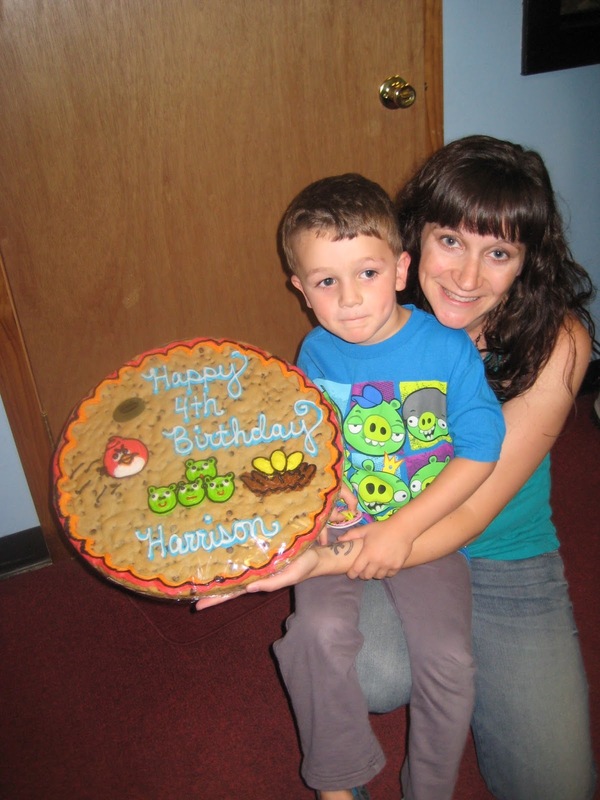 Enter Harrison’s afternoon snack: the final piggy with the four gloriously green candles. To continue in the spirit of reality, however, allow me to pull back the filter once again…we had another little meltdown before this singing/snacking/photo taking session. 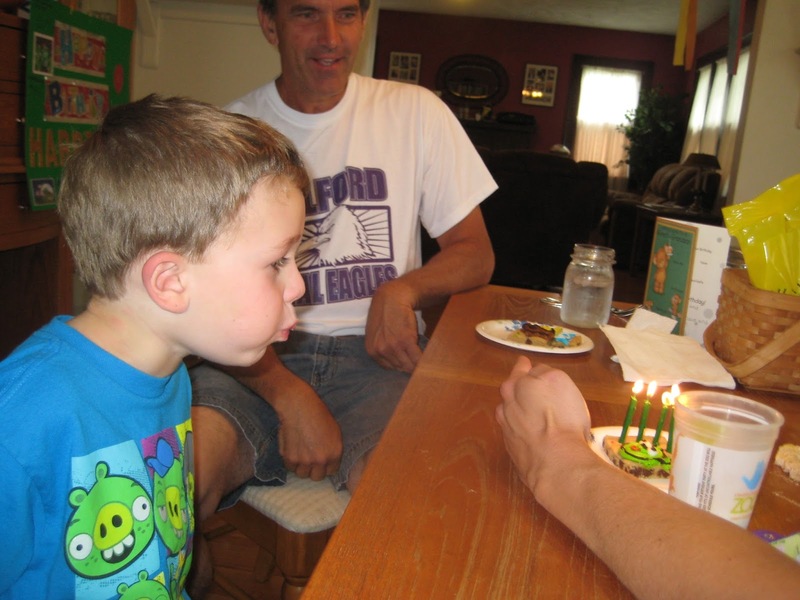 As you may remember, I once scarred (emotionally, not physically) my child with birthday candles and celebrations and that he has not forgotten. So it took some coaxing and “Use your words”ing to get to the point where Daddy’s arm could serve as a protective barrier and HD could blow out the flames, but we got there. And that’s the moral of my story: we may not understand and we may shed some tears (happy and sad), but we always get there and we do it together.